A tornado touched down on Hurricane Creek Rd. just southeast of Auburntown 1:00 a.m. Tuesday. 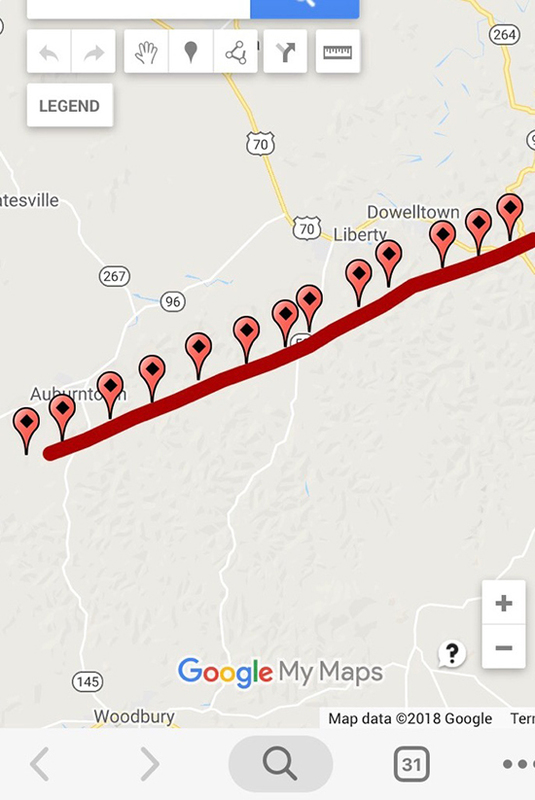 According to Cannon County EMA Director Roy Sullivan, who provided the images, the tornado traveled toward Gassaway and Liberty, causing damage to several residences and businesses. "The NWS Nashville came out today to survey the damage and have estimated it as an EF1 tornado, with winds estimated to be 100 mph. Several residents in the Auburntown area were pleased to receive a reverse 911 notification on their phones that is automatic in the event of a Tornado Warning," Sullivan said. Immediately after the storm came through, the Auburntown Fire Department immediately began searching the area for damage or any injuries. The AFD located numerous downed trees completely blocking Hurricane Creek Rd. and Hawkins Hill Rd. before any calls came in from residents. Power lines were also knocked down in one section of Hurricane Creek Rd. Power was quickly restored by a quick response from MTEMC. The roadway was also fully open by 3 a.m. by quick response from the County Highway Department. Also assisting in searching the area and traffic control were deputies from the Cannon County Sheriff's Office.